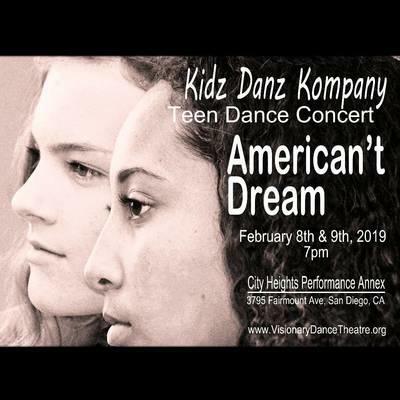 The critically-acclaimed and award-winning Kidz Danz Kompany, San Diego’s premier children’s dance company, presents their annual teen dance concert “American’t Dream”. Kidz Danz Kompany (KDK) Artistic Director Spencer John Powell presents his 1998 work “Horses”, re-imagined for the teen dancers. Powell will also stage a new work called “Letter To Parents”, an athletic and fast-paced work choreographed to the spoken word. This piece focuses on the need for parents to really listen and see the hidden potential of their teens. Lastly, the teens will close the show with a new work titled “America’s Mix Tape”. Choreographed by the teen dancers along with Powell, this work uses a variety of today’s music. This is a protest and a statement piece about the state of our union and the concerns of our young people. Join Kidz Danz Kompany as they tackle some of America’s most challenging topics and hot issues of the current day through dance.